Pack the 26th (Tue) with family-friendly diversions at Linnanmaki Amusement Park. There's lots more to do: brush up on your military savvy at Sea Fortress Suomenlinna, pause for some serene contemplation at Helsinki Cathedral, admire the masterpieces at Kansallisgalleria, and contemplate in the serene atmosphere at Uspenskin Cathedral (Uspenskin Katedraali). To find photos, where to stay, and more tourist information, read Helsinki holiday planner . London, UK to Helsinki is an approximately 6-hour flight. You can also do a combination of flight and ferry; or drive. Traveling from London to Helsinki, you'll lose 2 hours due to the time zone difference. Expect slightly colder temperatures when traveling from London in February; daily highs in Helsinki reach 0°C and lows reach -3°C. Finish up your sightseeing early on the 27th (Wed) so you can travel to Levi. Kick off your visit on the 28th (Thu): glide through natural beauty at Levi Ski Resort. Get ready for a full day of sightseeing on the 1st (Fri): have some family-friendly fun at Kid's Land, look for gifts at Elan Ski Shop & Rental, then explore and take pictures at Ice Karting Levi, and finally make a trip to Giewont Husky Adventures. For maps, where to stay, other places to visit, and more tourist information, you can read our Levi trip builder app . Traveling by flight from Helsinki to Levi takes 4.5 hours. Alternatively, you can do a combination of flight and bus; or drive. In February, Levi is slightly colder than Helsinki - with highs of -5°C and lows of -12°C. Finish your sightseeing early on the 1st (Fri) so you can drive to Rovaniemi. On the 2nd (Sat), see exotic creatures in open habitats at a safari tour, then look for gifts at LAURI, then have fun at Santa Claus Office, and finally get in on the family fun at Santa Claus Village. 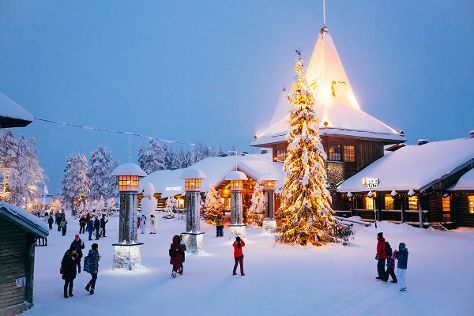 Here are some ideas for day two: find something for the whole family at SantaPark - the Home Cavern of Santa Claus, then take an in-depth tour of Arktikum, and then take in the architecture and atmosphere at Rovaniemi Church. You can drive from Levi to Rovaniemi in 2.5 hours. Alternatively, you can take a bus. In March in Rovaniemi, expect temperatures between -1°C during the day and -9°C at night. Finish up your sightseeing early on the 3rd (Sun) so you can travel back home.